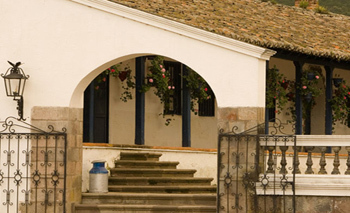 The charming haciendas of Ecuador are living relics of the rich history of the Andean region. Rustic elegance, spectacular natural settings, and an air of history are typical of the haciendas. Zuleta Hacienda was built on orders given by the King of Spain at the end of 16th century and the majority of its construction was completed in 1691. 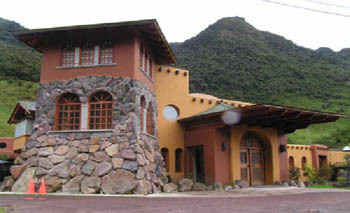 The Zuleta Hacienda is part of the Ecuadorian Ecotourism Association and encompasses 2.112 hectares of pasture land, forest and protected areas of native primary forest. The hacienda’s main production consists of 6.000 liters of milk daily, which is used to produce semi-aged cheeses, cream and yoghurt. The Mashpi experience is about discovering life in the tree tops, trekking along trails, listening to animal calls, absorbing each and every colour, bathing in pure waterfalls, spotting butterflies and birds, encountering amazing creatures, or simply relaxing with a view of clouds playing hide-andseek with the forest. Share our passion for the awe-inspiring rainforest and explore it, as nature comes alive before your eyes. The Hostería Abraspungo is located at the 3 kilometer marker on the way to Guano city, in a residential suburb named “Las Abras”, in the city of Riobamba. Its name comes from two words: “Abras”: from the Spanish word “abra”, which means a deep rupture in the hard earth caused by erosion from water. “Pungo”: from Quichua “pungu”, which means door or entrance. Abraspungo is also the name of a glacial valley which is located between the mountains Chimborazo and Carihuairazo, at 4.000 meters above sea level. Bellavista lodge located Less than 1 hour 45 minutes from the heart of Quito city, or 1 hour from the Mitad Del Mundo Equator monument. Bellavista offers comfort, tasty and varied cuisine, fine wines, combined with original and comfortable accommodation. Many trails to explore within the reserve, and the option to explore further the wonders and variety of northwestern Ecuador, different birds, a butterfly farm, zipline canopy experiences, waterfalls galore, come preferably for various days, or even one day if time is short. 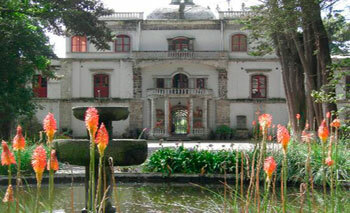 Hacienda Cusin was founded in 1602. 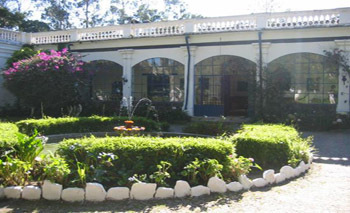 In 1990, Cusin's English owner converted Hacienda Cusin into a "country house" inn of 25 guest rooms, suites and garden cottages whilst preserving its history. Cusin's monastery provides 18 spacious guest rooms and its white buttressed walls, towers, parapet, cloisters, garden and fountain courtyards add distinction to the ancient landscape. The 40 acre complex, including its valley farm, Gualavi, lies at 8,500 ft. in the Ecuadorian sierra, 90 minutes north of Quito, on the outskirts of the village of San Pablo de Lago and its two mile crater lake. Hacienda Pinsaqui is ideally situated at the base of Imbabura Volcano, just 5km north of the world-famous Otavalo market and only two hours from Quito. 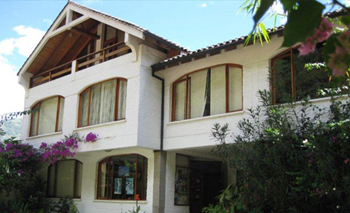 The location is an ideal base from which to explore and allows easy access to the region's attractions, such the lakes of San Pablo, Cuicocha and Mojanda, as well as the white colonial city of Ibarra and local villages. The house was constructed in 1790 originally as a colonial textile workshop. Over the centuries, Pinsaquí has hosted numerous illustrious guests including General Simon Bolivar, the revered liberator of Ecuador, who often spent the night at the hacienda on his trips to and from Bogotá, Colombia. 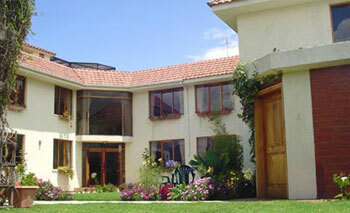 The Hotel La Mirage is perched on an Andean hillside a one and a half hour drive north of Quito. The contemporary resort was built on the grounds of 200 year old hacienda. From the hotel's glass pavilions, you are able to watch peacocks and hummingbirds or just relax in the gardens. La Mirage Spa Hotel offers different types of massages and treatments, including reflexology and aromatherapy. You can also enjoy the healing powers of a female shaman who has inherited years of experience from her father. The purification room is oriented towards the established indigenous healing practice for body, soul and spirit. Located over 10,000 feet above sea level in a humid montane forest, Papallacta Hotel Thermal Springs Resort is just 1 hour away from Quito. Nestled high in the Andean Cordillera at the entrance of the Amazonian jungle, Papallacta features several hot thermal spring pools of different sizes and temperatures. Resort facilities include a first-class hotel and a restaurant offering local and international cuisine with its main specialty: fresh trout. Guests may also trek along several marked paths alongside pristine mountain streams observing the habitat of condors, pumas and spectacled bears, among other indigenous species. Puerto Lago Country Inn & Marina is located 90 minutes North of Quito, and the route is a beautiful and relaxing drive through the mountains along the main Ecuadorian Highway where you can see snow capped volcanoes and enjoy fantastic views. Puerto Lago is nestled on the shores of the legendary San Pablo Lake with a breathtaking view of the Imbabura Volcano at over 8,000 feet above sea level. It has extraordinary views of the Ecuadorian Andean Mountain range and is only 8 minutes away from the city of Otavalo and its world famous Indian market. The average temperature in the area is 70°F. Surrounded by beautifully maintained lawns and gardens, the inn offers a remarkable and unique setting for its comfortable and high quality European style chalets which provide all the necessary amenities at affordable prices. The Sachatamia Hotel is a marvelous ecological reserve with 120 hectares of cloud rainforest. Sachatamia has a privileged location right next to the protected forest of Mindo-Nambillo. The area is recognized as having one of the richest biodiversities of flora and fauna. It has achieved first place in the annual global bird species count. The natural paradise of Sachatamia offers a peaceful location where guests can escape the noise and stress of the city. The Samari Spa Resort is located next to Baños and provides extraordinary, spacious gardens with an exotic atmosphere. The resort has the biggest Oriental spa in Ecuador, where you can enjoy various baths and alternative therapies with medicinal plants and minerals that are taken from the natural surroundings. 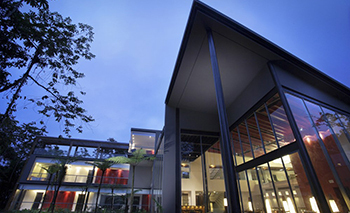 The fully equipped convention center can accommodate 280 people and includes the latest technological facilities. The hotel can also organize banquets, receptions, business meetings and unforgettable weddings. 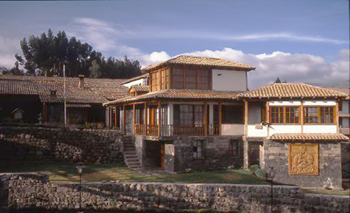 The colonial Hacienda of San Agustín de Callo was built on the site of an Inca palace, one of the two most important archaeological Inca sites in Ecuador. 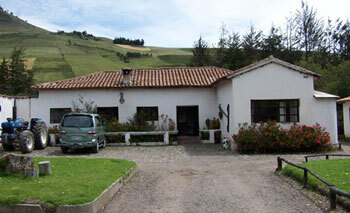 It is situated close to the entrance of the Cotopaxi National Park and just a one and a half hour drive from Quito. Since the 15th century San Agustin de Callo has served as an Inca fortress, an Augustinian convent and a temporary home for the French Geodesic Mission. Hacienda Hato Verde is found in the Cotopaxi province, approximately an hours drive south of Quito along the Latacunga highway. It is a few kilometers away from the main entrance to the Cotopaxi National Park. 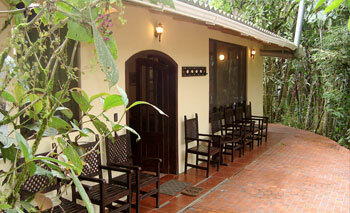 Hato Verde is part of an old cattle ranch whose main house is 120 years old. It has been remodeled to preserve its stone materials and rustic colonial style. In the surrounding area you will find the markets of Saquisilí, Latacunga, Pujilí and Ambato, as well as the picturesque lakes of Yambo, Anteojos and Quilotoa. 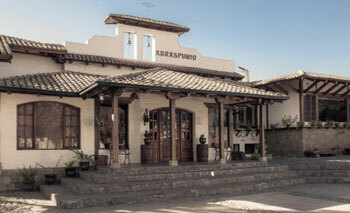 Set in a historic hacienda (ranch) where tradition and history surround you like the mountains and volcanoes, the hotel is to be found 16 kilometers outside of Riobamba in the Indian area known as Chuquipoggio, meaning watershed, from the indigenous words chuqui (water) and poggio (shed) signifying that water flows down here. Located in the shadow of five of Ecuador's most awesome peaks - Chimborazo, the highest peak in the country at 6310m, Carihuairazo (5020m), Tungurahua (5016m), El Altar (5319) and Cubillines (4455m), the Hostería La Andaluza, just outside Riobamba, is the ideal location for those who wish to relax and take in the fantastic scenery that surrounds it. 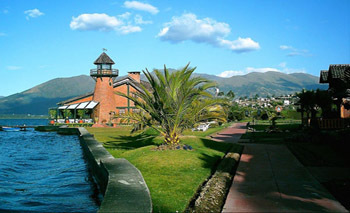 La Cienega, the oldest and most splendid colonial hacienda in Ecuador, has belonged to the descendents of Marques of Maenza since the seventeenth century. Situated on the outskirts of Volcano Cotopaxi and its national park, it’s just an hour and a half’s journey from Quito, capital of the Middle of the World. Surrounded by the Andes most magnificent snow-capped peaks, the hacienda, which was converted into a beautiful Ecuadorian mountainside lodge with two-metre thick walls carved from volcanic rock, finally opened its doors to the public in 1982, offering charm, history and tradition. Ingapirca Inn is located in the most beautiful and mysterious region, which was once populated by Cañaris and Incas, and contains the most famous archaeological monument of Ecuador – the Ingapirca ruins. The inn is a surprisingly attractive converted 200 year-old hacienda, decorated with brightly coloured woven crafts and colonial antiques. 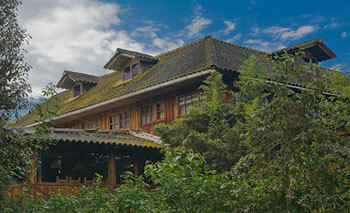 Sangay Spa Hotel in Baños is run by English climber Brian Warmington and his Ecuadorian wife Martha. The Sangay Hotel is located next to an impressive 80 meter waterfall and is just across the street from the most famous thermal baths in Baños which have stimulating, health restoring properties. The waterfall can be admired from the balcony rooms. 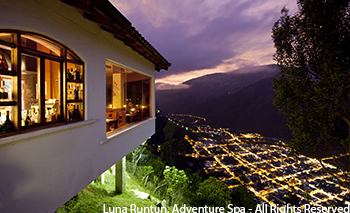 Volcano Hotel is located in a privileged, tranquil area of the city of Baños with spectacular views of the waterfall of the Virgin and surroundings. The city of Baños de Agua Santa is located in the heart of the country and is the gateway to the tropical rainforest and the beauty of eastern Ecuador. The Volcano Hotel offers ecological tours as well as a lot of activities like trekking, mountain biking, rafting, canyoning, rock climbing, bungee jumping and more. 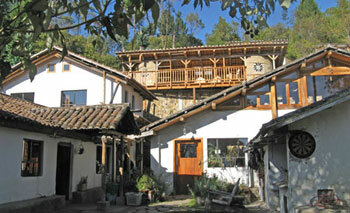 The Black Sheep Inn is an inexpensive, ecologically friendly hotel high in the Andes Mountains of Ecuador. It is located in the heart of the Andes Cordillerra mountain range, a few hours walk from Quilotoa Lake. The lodge is a perfect place to discover centuries-old culture and diverse ecosystems. 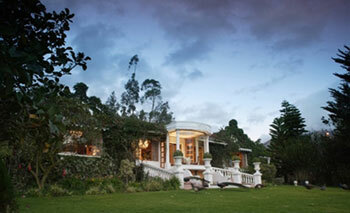 The bed & breakfast features gourmet vegetarian food with organic produce from the gardens. It is a perfect location if you are a backpacker, tourist, traveler, or vacationer. 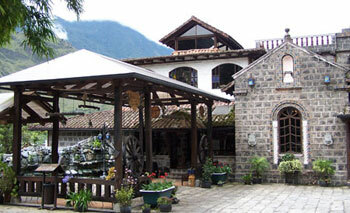 The Hotel Cabañas del Lago is located in the province of Imbabura which has a large number of tourist attractions. On Cabañas del Lago, the meeting and conference rooms are equipped with the latest technology and can accommodate more than 80 people. The hotel also offers activities and entertainment for children of all ages. 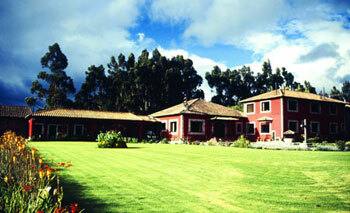 The hacienda is located right on the Quilotoa Loop in the foothills of Volcano Cotopaxi. 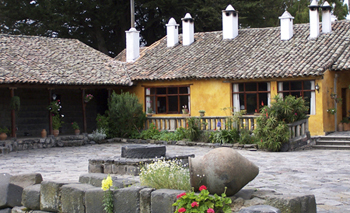 The hacienda is the preferred starting point for excursions to Cotopaxi National Park and the best place from which to visit the indigenous markets of Saquisilí and Zumbahua and the Quilotoa crater. 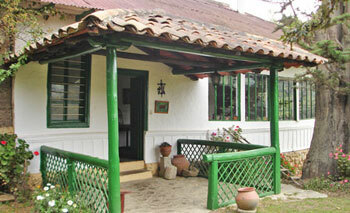 Cuello de Luna also offers budget lodging in dorms with shared bathrooms and camping facilities. 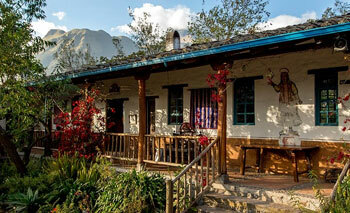 It is said that Hacienda Cuello de Luna serves the best Ecuadorian highland coffee. 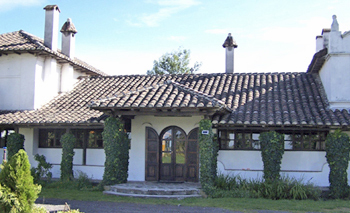 The Posada de Tigua is situated 55km from the city of Latacunga. The house is approximately 130 years old, and its walls are manufactured with mud, straw and horse manure. Contributing to the environment, the house has a water turbine which generates electricity and a shower that operates on the same alcohol ensuring minimal environmental impact. The meals are prepared with organic products from the farm, as well as our own made yogurt and cheese. Typical dishes of the house are dry roasted mutton and lamb. 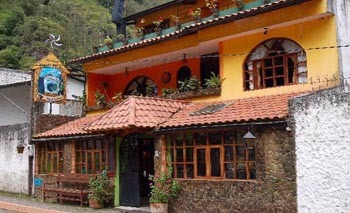 From the Posada del Arte Hotel you can hear the gentle sound of the waterfall which falls on the mountain only a half block away in the city of Baños. 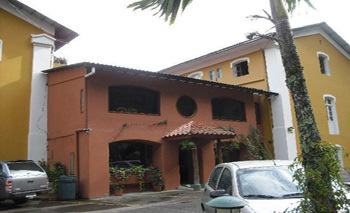 The Posada del Arte hotel has artistic works of Ecuadorian painters. These works of art are found throughout the hostel. The living room invites the guests to relax, read, listen to music, enjoy the fireplace or watch television. The hotel is a guesthouse with a European-style atmosphere. 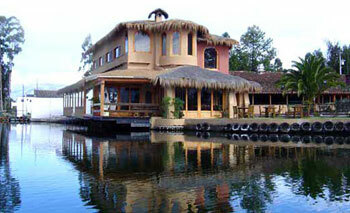 It is run by an Ecuadorian-German couple, who have managed to merge the traditions of both countries. The hotel contains two terraces from which to enjoy the atmosphere and the view outside. The dining room inside has a cozy fireplace. 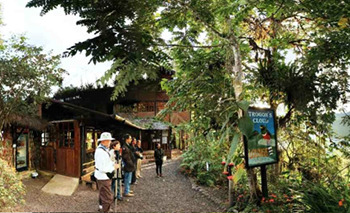 Tandayapa is the only lodge in the world designed by birders, owned by birders, and run for birders by birders. Here your hobby is not some peripheral side-line to a normal tourist trap. This is a place where your passion for birds and wildlife is shared by the other guests and staff. It's a place where you can see twenty hummers in an day, a dozen other species passing by the dining room windows over breakfast, and over one hundred species from our balcony alone. Now, throw in the canopy deck, the large forest floor feeding hide, and our extensive trail system, and you have the ultimate birding destination.